How do you design a gum with a story from out of this world, while showcasing it's natural, plastic-free origins? 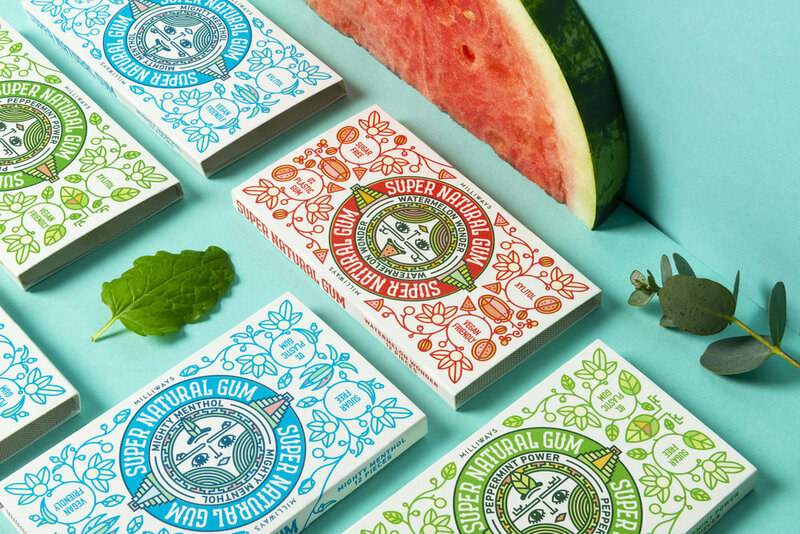 We were given the imaginative brief to create a piece of brand design for Milliways Super Natural Chewing Gum, a new brand of gum based on the story of the explorer Nu-Choo, who travels through galaxies to find new natural and delicious flavours. At the heart of the design is an intricate line-work illustration. This brings to life a world of flavour, evoking the mystical story behind the chicle tree gum and its Aztec origins, as well as Nu-Choo's face, which rotates to reveal her superhero persona. A striking design and strong visual world pulls Milliways away from it’s competitors, and brings together a new and expressive brand story with a delicious and natural product.